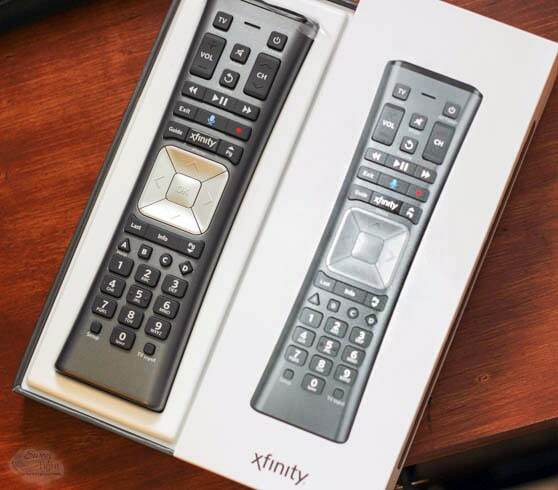 The highly anticipated XFINITY Voice Remote is here, and it’s as awesome as promised. Searching by title is only one of the amazing things that you can do with this new voice remote for the X1 System. Post and giveaway sponsored by XFINITY, but all opinions are my own. Please see below for additional disclosure. So, a few weeks ago Mike and I were scrolling through the many areas of the X1 XFINITY system. A movie that we both wanted to see caught our eye. Neither of us had the time to devote our full attention to a good movie at that point, so we just mentally made a date for another time. Well, Saturday night rolls around, and it’s an excellent time to settle in for a movie. Where the heck was it? We searched and searched and couldn’t find it. We didn’t realize until later that Mike had misspelled the title in the search box. In any case, we just gave up and chose another movie. Whoa, I didn’t know Anna Kendrick was in so many movies! 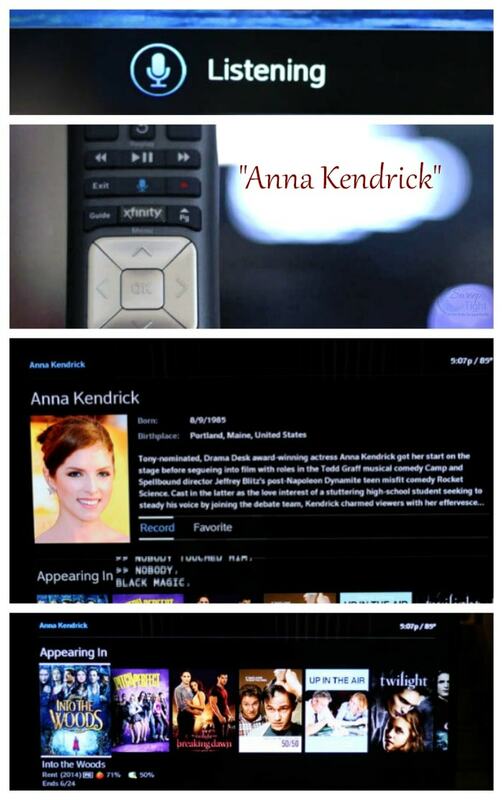 Fast forward to the present where we now have our very own XFINITY Voice Remote. No spelling skills needed. You just speak what you are looking for, and the remote finds it. Anyone in the family can use it. It’s not programmed to one voice. You can search by movie title, by actor/actress, by channel, and even by movie quote. That’s right, say “I’ll be back” and “The Terminator” pops up. Talking to your remote can help you discover so much more about your system. I think most of us are guilty of sticking to our favorite channels and tend to miss out on what else is available. For example, we wanted to search for the Chicago Blackhawks Celebration Parade, so we said “Chicago Blackhawks” into the remote. Several shows and highlights were being aired that Mike would enjoy watching. We added them to the DVR so he can check them out as time allows. The new XFINITY Voice Remote functions as a normal remote, as well. Actually, it’s better. It has a backlit keyboard and aim control for easier use in the dark. To us, it seems more responsive, too. No special commands are needed to work the XFINITY Voice Remote, but there are some cool hidden features. In addition to saying popular movie quotes, as I said above, you can also do other fun things. For example, if you say “Taylor Swift 22,” Taylor Swift will respond. If your child, or, let’s get real – yourself, sings “Let it Go” into the remote, the movie “Frozen” will appear. This remote is kind of creepy smart! New XFINITY X1 customers will receive a voice remote during their installation. Existing customers can either pick one up at your local XFINITY store or order online here. Requesting one shipped is free, except for shipping and handling. Disclosure: XFINITY partnered with bloggers such as me for their Fast Life program. As part of this program, I received compensation for my time. They did not tell me what to purchase or what to say about any product mentioned in these posts. XFINITY believes that consumers and bloggers are free to form their own opinions and share them in their own words. XFINITY’s policies align with WOMMA Ethics Code, FTC guidelines, and social media engagement recommendations. What’s the coolest feature of the XFINITY Voice Remote? The entire remote is wonderful! I love the voice command, and wow the search and X1 functions are so cool! find shows by voice command is pretty cool! I think the coolest feature of the voice remote is “Control DVR functionality”. WOW I have one of these great remotes at home, can’t wait to try it out. I like how you can change the channel just by speaking. I like that I can use voice commands to change the channels! I like the recomendations feature. I like it can be used to search for TV shows and movies. I think the coolest feature of the voice remote is you can find an actor, director, music artist or personality. I like that it will make recommendations based on your viewing history. I love how it gives you personal recommendations on what to watch. I like that you can search by actor, name of show, recommendations, etc. I can search by name of actor which would be great for me because I’m partial to certain actors than genres. I think the coolest feature is how you can just say what you’re looking for and it will find it. I love the voice command feature the most! I think the Get recommendations, and find out what’s popular now feature is the coolest! I think the command to find movies by actor is neat. I think this is such a cool remote. My boys have video game players that they are able to talk to and now we can have remote! I just love this idea! I like the ability to search for a show by saying it. I like the voice command feature the best. I like that you can search by actor or ask for suggestions on what to watch. I think the voice control is the neatest feature! I like that you can ask for suggestions and it will give you recommendations. The voice command feature all around is neat! I love you talk to the remote. It’s neat that you can get recommendations by asking what’s trending. I love that you can find a movie by just saying the name of an actor. I like one can find an actor, director, music artist or personality. I love the voice command feature – so cool that you can do things with it such as control the DVR. I also love the voice command.Very cool! I like that you can just say the name of an actor and it will locate what shows are on that they are in. I like that you can Control DVR functionality and record a show just by saying the show names. To change the channel based upon station name, WATCH DISCOVERY CHANNEL, would be great instead of me always having to ask my husband, what channel is discovery!! LOVE IT. We already have xfinity cable so this will be something I am looking into. I think the fact that it is voice activated is awesome! I also love the search features. The best feature to me would the voice command. This is pretty cool. I am loving the fact that you can speak movie quotes into the remote and it pulls up the movie for you. That’s just impressive! I like that it can be used to search by TV show names. I think the voice command is so cool! I like that you can use the voice command to change the channel. It does sound kind of creepy cool. lol I like that it will give you recommendations too. I think the voice command feature is the coolest! I like that it’s not programmed to one voice and even my kids would be able to use it. I LOVE the voice command! I think that’s so awesome! I just think that everything can be done by voice command is the coolest. I love the voice control!! I like the fact that the voice command works without having to fool with all those buttons. Find an actor, director, music artist or personality! I that the voice command function is awesome! I think its neat that you can control the DVR with a voice command! Thats awesome! I love the voice command can change channels and find movies. This feature is great! — Voice commands can also be used to search for TV shows and movies. I like the Control DVR functionality. I have never heard of something like this. The coolest thing is that I can search by movie quote. The quotes are what I always remember more than the titles. I like that you can search by a sports team name. I love everything about this remote! But the coolest feature to me is that it isn’t sensitive to any one voice. My kiddo’s can use it the same as my husband and myself! I love that you can just ask it to find a show you want to watch and it will seek it for you. I like that you can use it search for TV shows, movies. I love the backlit keyboard. I think it’s pretty cool that you can get recommendations. Its so cool – the voice recognition! To change the channel without worrying about knocking my drink over reaching for the remote would be life changing. haha. I love the voice control. I like that you can use voice command to search actors! I like that it kind of decides for you based on what YOU like what you should watch. I like that you can search by actor. Oh I really love that you can Find an actor, director, music artist or personality! That is so neat! That I can get recommendations, and find out what’s popular now! The coolest feature is all the different search functions – by show, director, genre, etc. This is the craziest product I have ever heard of. It comes close to the cablebox watching eye article I read about about a year ago, very creepy. Most assuredly, I’ll be trying this product, Thanks for the review. I love the ease of the Voice Command feature. You simply speak! There’s no more tedious typing involved! My goodness, I had no idea a Voice Command Remote had even been invented. The whole Voice Command Remote itself is the coolest thing. If I had to pick one of the features I really like – I think its great that you can not only look for specific shows or movies with the remote, but that you can look for a specific actor, musician, personality or director. I like the Voice feature because we always know what movie we are looking for but sometimes we couldnt find it because we were not spelling it the correct way. I could just say what Im looking for!! Thats awesome!! I think that the coolest features of the voice remote are that I can get recommendations and find movies based on quotes or actors in them. I think the voice feature would be great for searching! It’s so time consuming to type in all those letters individually! My favorite feature is the Voice commands that can also be used to search for TV shows and movies! I like that you can change the channel by just speaking the channel name. The search by movie quote feature is my favorite! Obviously the voice control is awesome! Searching by movie quote is also amazing! I know I look things up on google this way! I love the feature that you just speak what you are looking for, and the remote finds it. I have limited use of my hands and that would be the perfect solution for me. I like that you can find a particular actor. I currently have X1 and the voice remote as well 🙂 I like that you can search anything by voice. I just started watching a new (to me) show, Finding Carter, and I spoke that to the remote and it showed me what Xfinity had available to watch on-demand. I like that you can search for the tv show. I know what shows i like to watch but i almost always forget what channel they are on or what time or day they are on. That would make it so much easier! Um,voice commands is really awesome but also the recommendations might really be useful too! I like the voice commands especially searching for sports events. That you can even find shows by the actor’s name! With a large family, I love the fact that it isn’t programmed to one voice. The voice feature is amazing all though the kids may use it agaisnt while I am trying to watch my soaps! lol!! I love that you can pause a show using your voice, this would come in handy when you are watching in a dark room and cannot see the remote. I like that you can even use movie quotes to look movies up, that’s too cool! I like that you can use voice command to search for shows. I hate having to manually type in shows on my direct tv! i love this voice command! I like that you can change channels with the voice remote. I think the ability to control DVR functionality is the coolest feature of the voice control remote. THE BEST FEATURE OF THIS PRODUCT IS VOICE CONTROL. I like that you can ask it what is on at a certain time. Also like that you can tell it an actors name and it finds a show with it. I loooove the voice commands! Voice control sounds awesome especially for handicap people with hand problems who have a hard time with a remote like my hubby. I think the voice command is one of the coolest features! Technology just keeps getting better and better! It would be wonderful to use the voice command to search for the name of the show I want to watch and by the channel name when I don’t know the channel number. Using voice command means not having to put your glasses on to read what you’re trying to find! lol.. Brilliant idea! Since we lose the remote in the couch, the voice command would be great! That I can literally say “find taylor swift” and it will find her on tv. That’s amazing!! Or I can find a nice tom cruise movie that way. I love the voice control feature. So cool! I like being able to use voice commands to control DVR functionality.